In a large saucepan over a medium heat add a drizzle of olive oil and brown onions, with a pinch of salt to draw out the moisture, garlic and chilli flakes, cook until the onions start to caramalise. Add stock and diced tomatoes. Bring to boil. Break spaghetti into broth and mix. Cook for 5 minutes until spaghetti begins to soften. Add vegetable packets and cook for 5 more minutes or until pasta is cooked. Add chicken and stir. 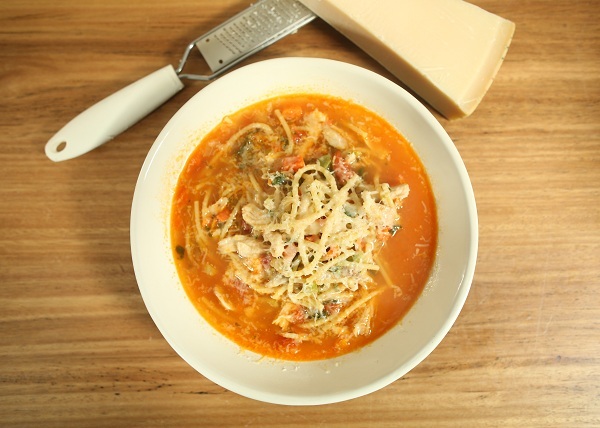 Serve in a bowl and finish with grated parmesan cheese and a bread roll. Enjoy!